It was the final curtain of a very long standing war spanning 30 years. Nobody would have ever guessed that it would end at Xuan Loc, let alone with the South Vietnamese 18th Division, known to be an unreliable unit. Yet, it was here at the small town that the division stood and the world watched in amazement the defiant, heroic last stand from April 9 to 21. 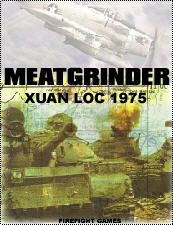 The NVA really had not planned for such a battle, they too, were surprised for their Spring Offensive was steamrolling everywhere and now focusing on Saigon with huge forces. For the NVA 4th Corps with three divisions, they had been meeting little resistance as they traveled down Highway 1 and Highway 20. The ARVN 18th had already repulsed the NVA in mid-March but now had fallen back into their final defensive positions in and around Xuan Loc. Then the miracle began. 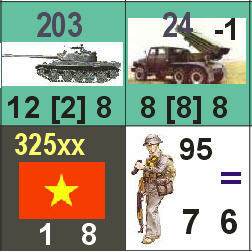 The ARVN soldiers were brilliantly defiant. It became a prideful battle for them and the NVA had to commit 40,000 men to take on a single division that simply refused to budge. ARVN air support was amazing and dropped daisy cutter and CBUs causing heavy NVA casualties in one swoop. The town changed hands many times. 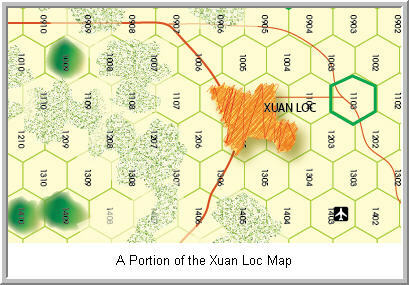 280 counters, 1 11x17" map, 800yds\hex, units are company\battalion. Rules cover leaders, aircraft, CBUs, armor, Quads, Command Control, Random Events.